‘Opleuken’ is an example of the Dutch tendency to create verbs whenever we have a need for one; the use of ‘op’ (which can mean ‘up’) in this case indicates that an improvement is the result. – “Het gezellig maken”: to (physically) improve the atmosphere, to make it more pleasant / cosier. (“Oh, you have created such a nice atmosphere here! And that despite the big space!”). – Leuk: nice, pleasant [adjective]. 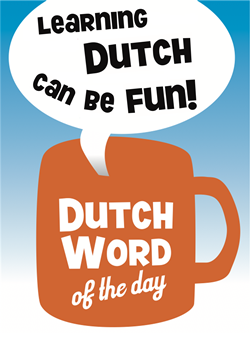 – Gezellig: pleasant, enjoyable, nice, fun, good atmosphere, cosy [adjective/adverb]. – Verbeteren: to improve [verb] [verbeterde, verbeterd]. – Mooi maken: to beautify, to adorn, to pretty up [verb] [maakte mooi, mooi gemaakt]. This entry was posted in Dutch word of the day, DWOTD 1.0, Vocabulary Guru and tagged opleuken by Sander. Bookmark the permalink. De “random” knop heeft de website echt nog verder opgeleukt! Goed bezig! Also, in a perfect solution the button would appear on every page (not just the main page), so you could click on it again and again, jumping from random post to random post. but i don’t want to “zeuren”. i’m really glad to see this implemented, it’s a great opportunity to discover random 🙂 words! Hi Max – indeed; actually I have a general improvement planned to always show the sidebar next to a specific DWOTD post. Your blog is very active….and lively. Kudos!